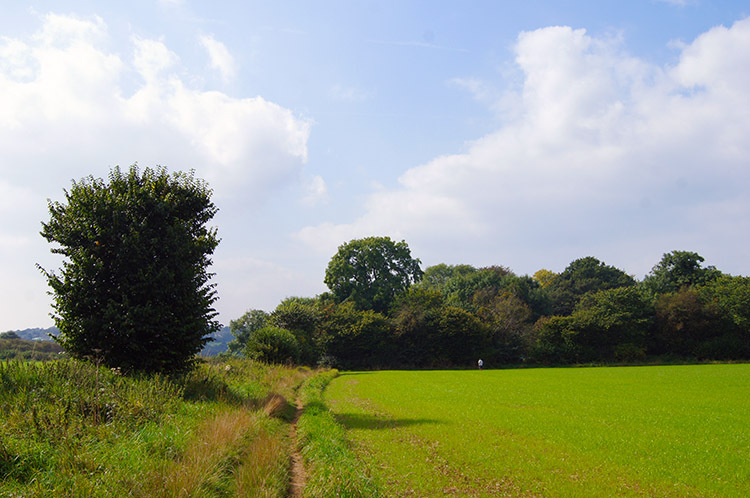 Summary: A rural walk in the north Leeds area. 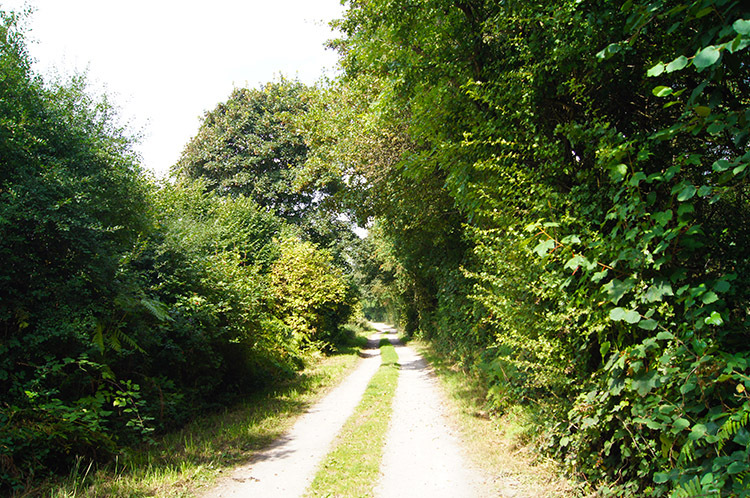 Starting from the quaint village of Thorner the walk crosses and edges fields, goes through lovely woodland, follows quiet lanes and visits a super nature reserve of woodland and crags which is also the site of an enigmatic Roman settlement. The Walk: Summer was drawing to a close and the nights were beginning to draw in. I felt this intense urge to take every opportunity available for a walk. I could not travel far because of final work commitments before retiring the water industry scene but I could take the four hour window which presented itself. Especially as it was a splendidly warm and sunny day. I set off from home mid-morning and travelled the half hour journey to Thorner from where I would start my walk. Thorner is one of the finest villages north of Leeds and ancient too, being listed in the Domesday Book of 1086. One curiosity of Thorner is that in the preceding ten centuries there is still no street lighting to be found in the village. 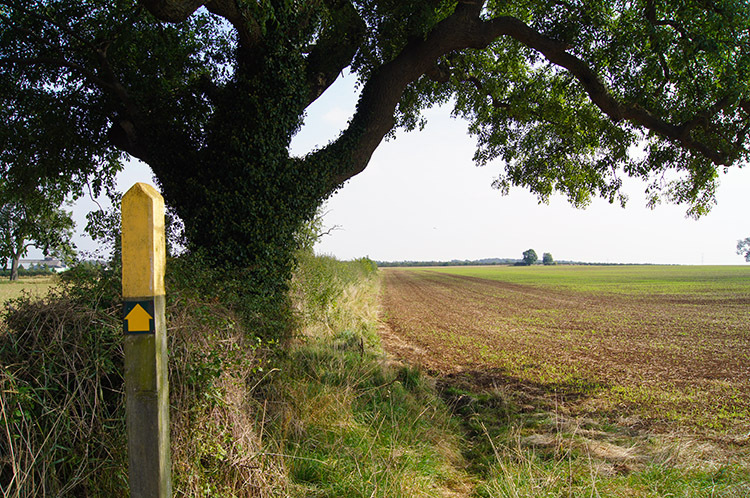 I set out from the main street of Thorner in perfect sunlight and walked east from the village along lanes of the edge of the most south-easterly estate towards Ellerker Lane. It was the quiet of a rural setting; a gentleman living in housing on the edge of the village was up a tree clipping some branches, a tractor was ploughing the field nearest the lane and a few rooks were cawing in the treetops of a nearby copse. Above the local sounds the distant drone of aircraft coming in to land at Leeds Bradford Airport on the far side of the city was distinguishable. 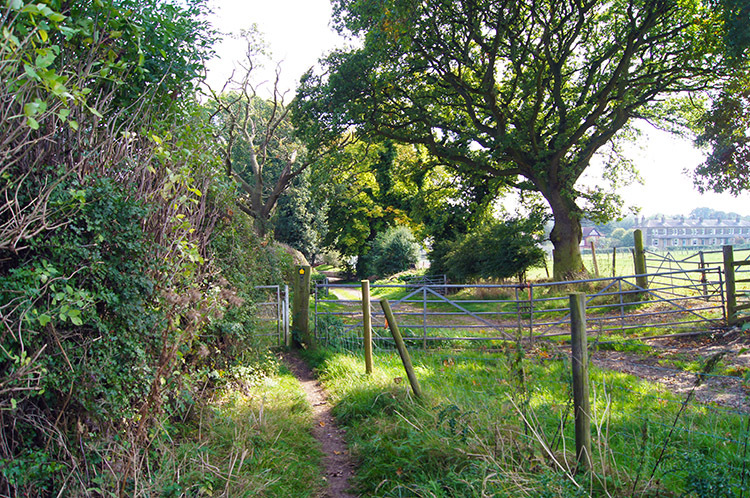 On reaching Ellerker Lane I turned right to walk south. As I walked along the lane all sound, local and distant, faded into the unconscious. 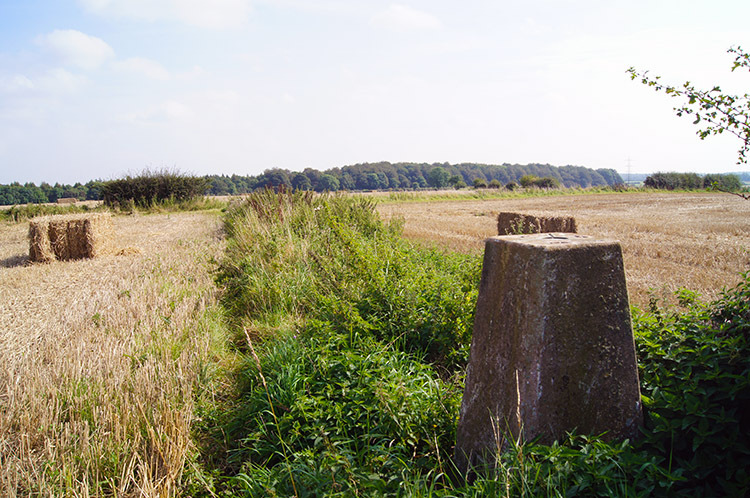 I did not walk along Ellerker Lane for long, turning after less than 200 metres to track east once more, this time along the sides of some fields and diagonally across one before keeping to the sides of yet more fields on the open expanse of Thorner Moor. Despite being just two miles north-east of the urban sprawl of the city of Leeds it felt like being in complete solitude. The views were far and wide across the large open fields of the moor and the near urbanisation seemed many miles away. Looking across Thorner Moor I could not see a single soul, not even a farm machine working the fields now after seeing the tractor ploughing the village-side field at the beginning of my walk. I reached the trig station on Thorner Moor and surveyed the scene from my lofty vantage point of 110 metres above sea level. After a short pause I continued south and east along the fields and as I did so picked up the second drone of the day. No aircraft this time, it was the distant roar of traffic speeding along the A1M to the east of Bramham Park, the stately grounds to which my walk was fringing. I reached Mangrill Lane where a thick border wood blocked out views of the park beyond. I headed north with the wood to my right. 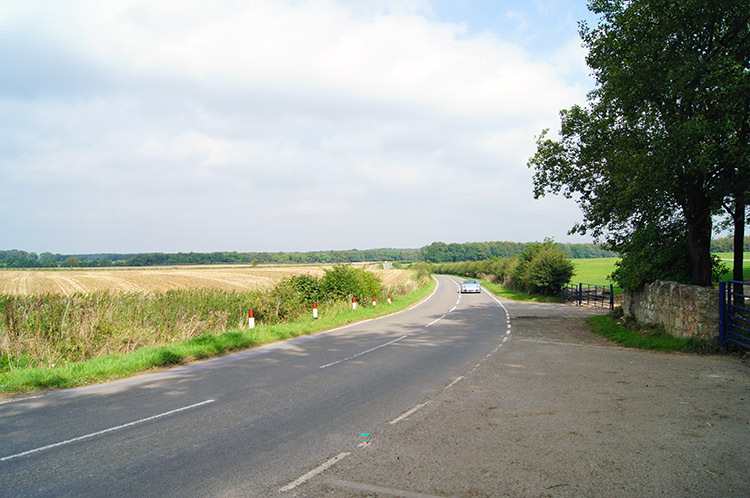 Mangrill Lane led me to a road linking the village of Thorner with the village of Bramham. I followed the road-side for a half mile before cutting left into woodland near the site of the medieval village of Wothersome. In the woodland I walked a few steps down a bank and reached a small pond which apart from a small stagnant stream was lacking of any visible water, dry from the summer heat. All that could be seen was a traffic cone stuck in the mud but eyesore as it was I was not going to test the mud to remove the cone and restore the aesthetics. I kept my feet dry and continued walking through beautiful woodland which was idyll advanced by the dappled light streaming though the green canopy overhead. As I walked the scene constantly changed, an ever evolving natural movie of incredible delight. I bounced my way through the woodland, stopping only to temper my excitement as I approached, greeted and passed a few solitary walkers, all with dogs on early afternoon exercises. I had curtailed my skipping and gambolling temporarily as I did not want them to think I was enjoying myself too excessively for want of being thought peculiar. 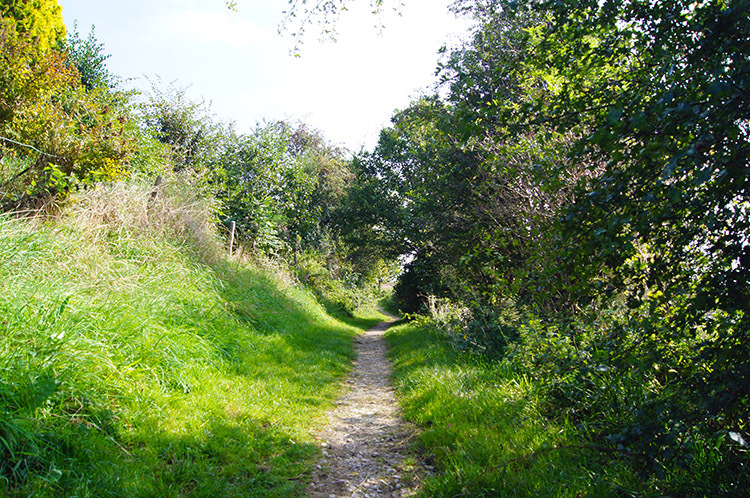 Sometime later I emerged from the woodland into the afternoon delight of a perfect mid September day and followed a couple of field sides to reach another road, this one the link road between Thorner village and Bardsey village. In the field beside the road a chap was prospecting the field with a metal detector. "Any finds" I asked. "No such luck" he replied. I left him to continue his quest while I crossed the road to enter Hetchell Wood. 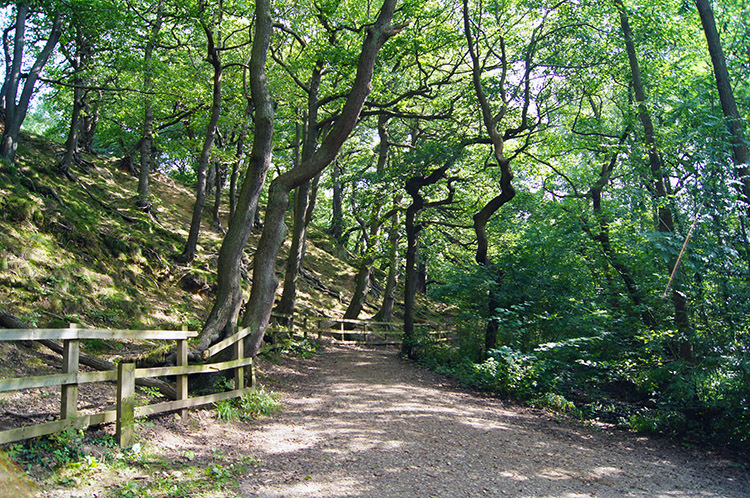 Hetchell Wood was the centre point of this walk. Being a member of the Yorkshire Wildlife Trust I like to visit the trust's sites and this one was on my list of visits. Hetchell Wood Nature Reserve captivated me right from the start. 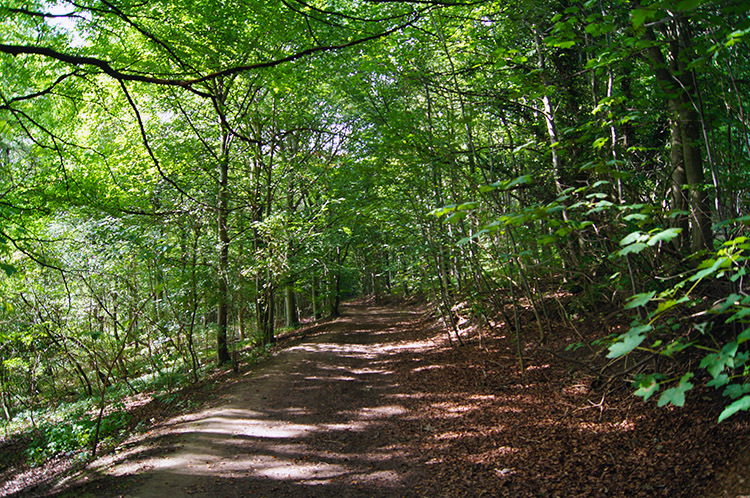 Soon after entering the wood I came to a open clearing with a steep bank on the east side. 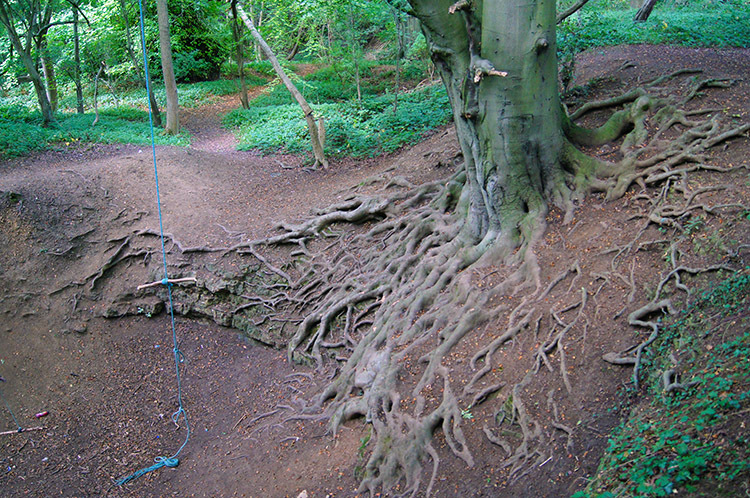 Ropes hanging down from the mature trees with tendril like tree roots sprawling out from the exposed ground revealed this was a place of adventure today. According to historians this was also a place of activity in roman times when the site was known as Pompocali. There are some foundation works exposed which may support the roman theory. Whatever the reason of the site is and whoever the architect was, the site is thought provoking and lovely just to stand in the midst of. 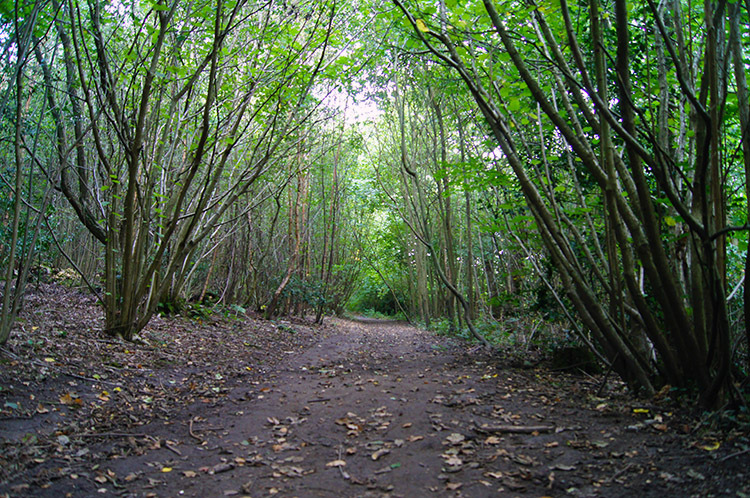 On leaving the open clearing I followed extremely good well managed paths through the woods. Compliments to the wildlife trust who maintain them, evidence of which was patently clear by the stacks of timber neatly arranged on the way around and the paths well clear of debris. 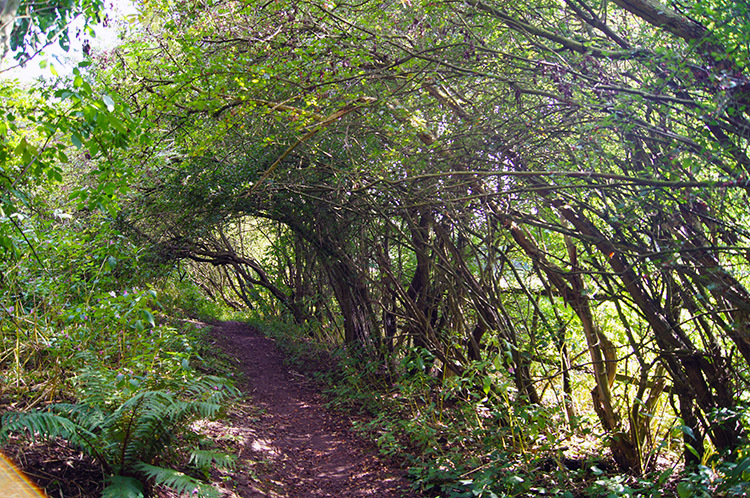 It was an easy walk thought the interesting and curiously varied woodland. 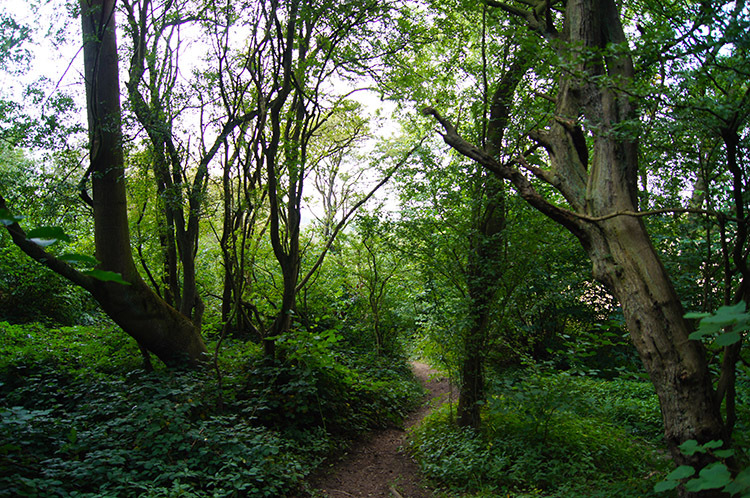 Some sections of the woodland were old with mature trees and other sections more recently established with younger coppiced rows of Oak, Hazel and Spindle. 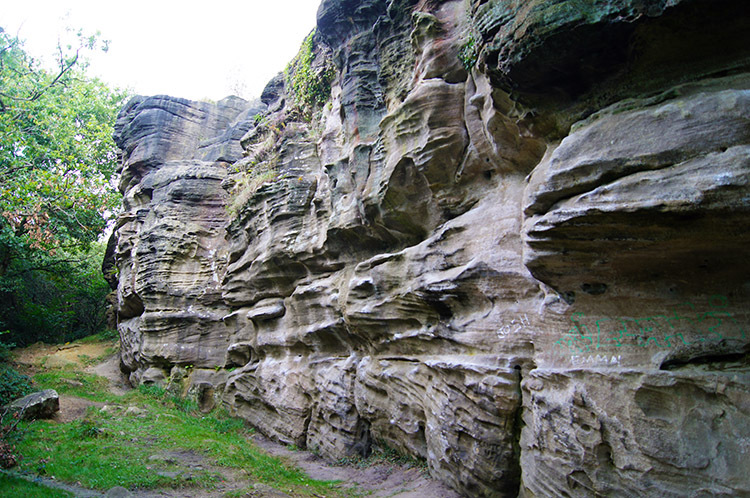 Along the way though the woods I came to an impressive grits tone outcrop. I had reached Hetchell Crags which is a popular spot for rock climbers. Interestingly some of the routes/ holds are named after the romans. Another case for Pompocali? I studied the crags with no intention of climbing them and then I continued on my way. I came out of Hetchell Wood and into the daylight once more beside a tiny stream which I chose to paddle across rather than take a footbridge which I had no need to use this day. I then followed the lane west and crossed the line of the dismantled Leeds to Wetherby railway line, climbing further along the lane and towards the A58 Leeds to Wetherby Road. 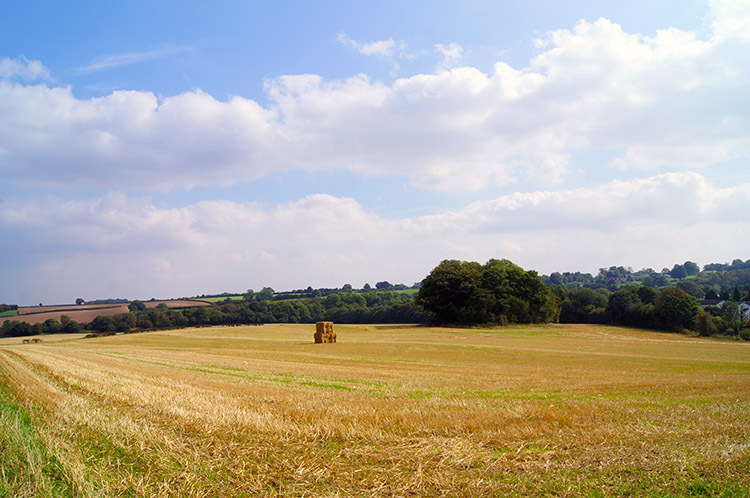 I left the lane just before Rowley Grange to follow the Leeds Country Way on a course due south across the brow of a small hill which gave me some pretty impressive views east over recently harvested golden cereal crop fields. I continued on with my lovely walk along paths beside spinneys to Moat Hall from where I followed the road for a short distance at Scarcroft Hill before crossing a field to Oaklands Manor from where I followed a lane beside fields back to Thorner. I arrived at the north side of the village and walked along Carr Lane back to the main street. My very nice walk was done. 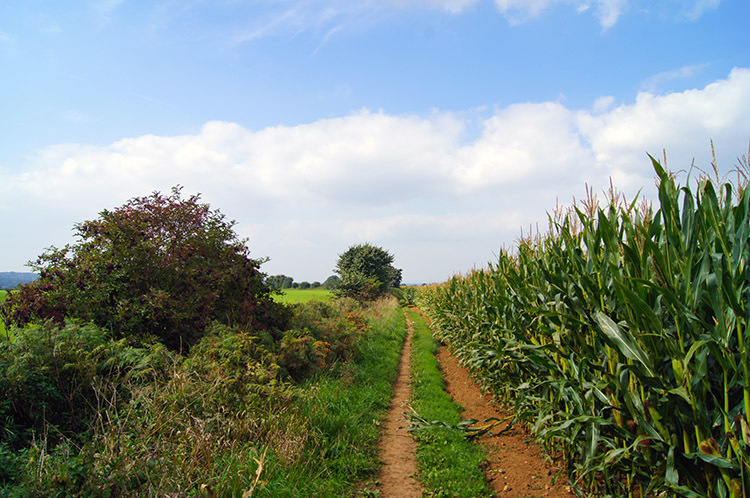 This is a perfectly manageable walk for all walkers in the exceptionally pretty rural countryside north of Leeds. The highlight is the Wildlife trust Reserve in Hetchell Wood though the woodland near Bramham Park is also very pretty and the views from Thorner Moor a lovely sweeping sight to see.